Award winning gym, art, dance, and music classes for kids make Kidville the #1 place for families with young children in Northern Westchester. Our classes and birthday parties help kids learn, play, and grow. Enroll in one of our award-winning classes for kids for just $115/month! Now enrolling for Camp Kidville 2019 for ages 18 months - 5.5 years! Yahooooo! Join us from 7/1-8/30 for 9 weeks of loaded FUN! New themes await you. Now through February 25th, members will save 40% on 8 weeks or more and non-members will save 30% on 8 weeks or more. Buy now and choose your weeks later. Sign up at any time for a Membership starting at only $115 per month. Add a sibling for only $50 per month. Receive complimentary playspace with any level of membership. Membership enrollment is ongoing. Join our award winning pre-school program Kidville University pre-school (2-3.3's; drop off) and KVU Prep (ages 18-24 months; with caregiver), and KVU Grad pre-school (3.3-4.5 years, drop off). Contact us today by emailing mayor.mtkisco@mykidville.com or calling 914-458-1909. Kidville is closed today, Monday, March 4, 2019 due to the snow. Parents Magazine Names Kidville One of the 10 Best Birthday Party Places for Kids! We love to host Birthday Parties at Kidville! Our all-inclusive approach, party planning expertise and energetic staff bring party magic to every Kidville Birthday Party. We are overjoyed to share with you that Kidville has been selected by Parents Magazine as one of theTop Ten Birthday Party Places for Kids! Parents Magazine looked into the activities, cost, and personalized options at more than 50 national chains that host kids birthday parties and bestowed Kidville with the honor of Best Dress-Up Party! Contact us TODAY to start planning your child's Kidville party! 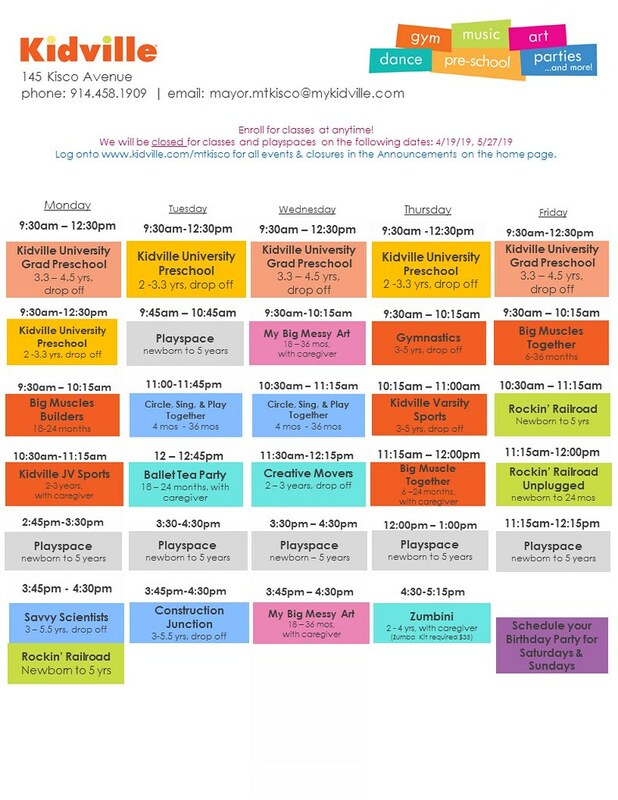 Register now for Fall 2019 school year of Kidville University, our pre-school program for children 2.0-3.3 years from 9:30am-12:30pm (M/T/TH) and KVU Grad for children 3.3-4.5 years from 9:30am-12:30pm (M/W/TH/F). Our program offers also offers UNLIMITED Playspace for siblings too! Contact us at 914-458-1909 to schedule a tour of our facility and meet our Early Childhood Education Team.